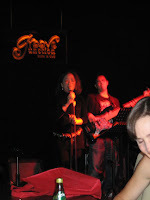 Groove Junction, a cosy little Jazz bar in Desa Sri Hartamas provided the perfect location for our get-together this month as we celebrated the outstanding contribution Jane Sullivan made towards ibu and BONDA over the past few years, and her impending move to Dubai in July. Melissa Smith ( ex- ibu Chairperson ) turned up as well, after vehemently disallowing us to have a farewell party for her! So it became a farewell party for two! 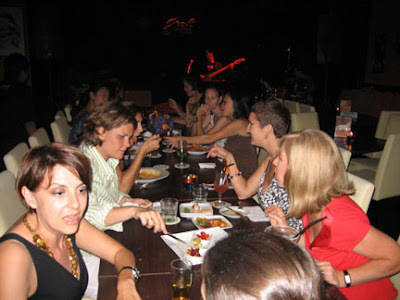 As the drinks flowed and the live band begun, the noise level became a bit too high and it was pretty hard to talk to anyone but the person next to you. But this didn’t stop any of the 16 of us from having a good time. The food was good, the portions large but the service rather slow and staggered due to the large crowd. However, the hospitality and the professionalism of the staff more than made up for it. 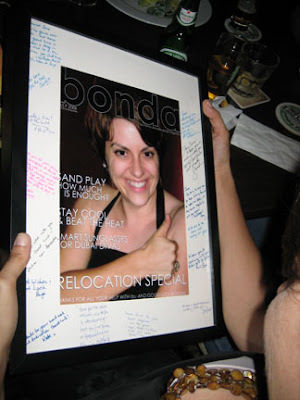 A few toasts were made, some speeches followed, followed by a tear or two and the night ended on a high note with some cake and the presentation of very special gifts for the Goodbye Girls – personalized BONDA covers, courtesy of incoming BONDA Editor Brigit Bose. You couldn’t have gotten a better going away present than that! So, if you enjoy some live music, check out Groove Junction for a change from the ordinary. Its’ worth the visit. As for Jane and Melissa, we thank you for all your years of hard work as volunteer Committee members in the ibu Family Resource Group. Your dedication to the cause made such a difference to the establishment and your shoes are certainly BIG ones to fill. We wish you well in Dubai and the USA! Everyone getting busy catching up before the live band started. 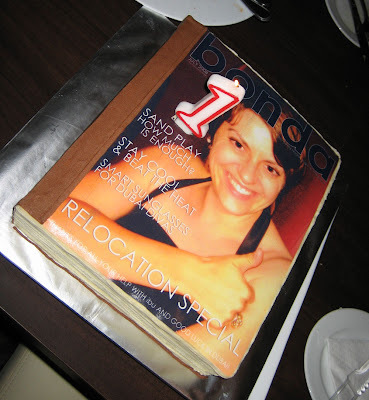 The Farewell Cake. Jane's the ONE! 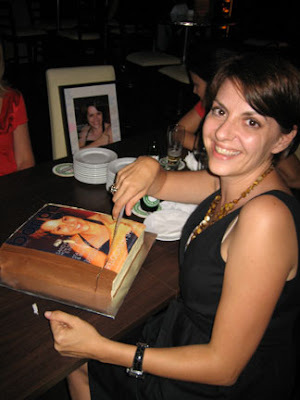 Jane, cutting into her farewell cake - an exact replica of her present! Jane ( ex-BONDA Editor )'s farewell present. Melissa ( ex-Chairperson )'s farewell present from ibu. 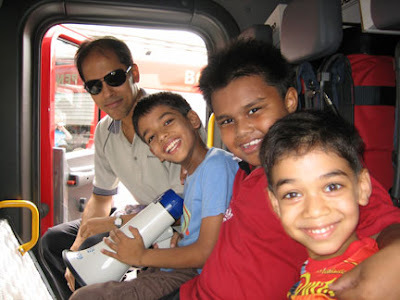 Family Day Out in June 2008 saw yet another return to the Desa Sri Hartamas Fire Station, in conjunction with Fathers Day. 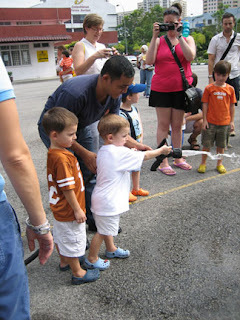 This time the response was overwhelming and the firemen played host to 33 ibu families! The day started with the viewing of a very interesting ( if you are a 60 year old ) video on home and fire safety – reminder to self, request NO video next visit! Many of the children, bored by the video, started gravitating towards the back of the Fire Station where the 3 trucks were parked. Soon it was pretty obvious to the Fire Master that only 3 people ( including one very patient 3 year old ) were watching the video and this was a clear indication to start the ‘real’ show. We were allowed total freedom in, around and on the trucks. 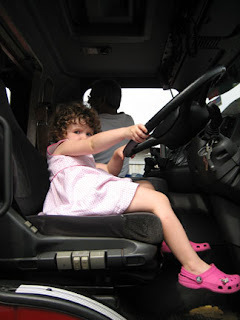 The keys were in the truck ignitions and 3 lucky souls were allowed to start the engines! Not a single ‘NO’ was uttered as the kids were allowed to touch the horns, sirens, light switches and the lot! 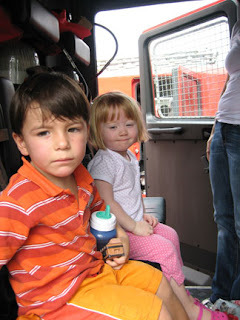 Children and their parents were all over the trucks and the cameras were working overtime. 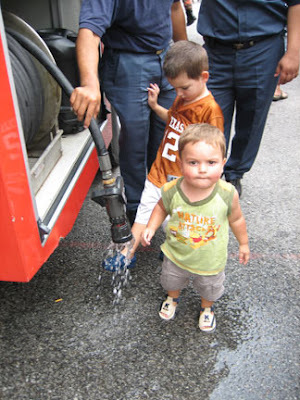 Soon, the hoses were brought out of the trucks and then the real fun began. 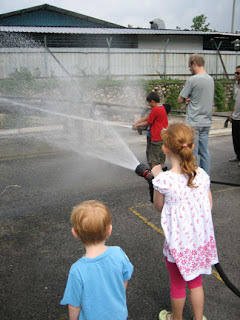 Hosing each other down while learning to control the flow, kids were soon sopping wet. This had to be the best part of the visit. 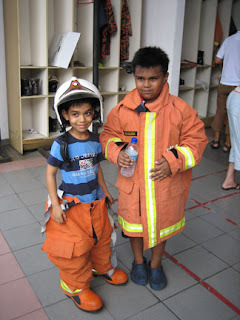 As the visit was drawing to a close, more photo opportunities were to be had as the firemen helped the eager ones get into the VERY heavy fire suits. 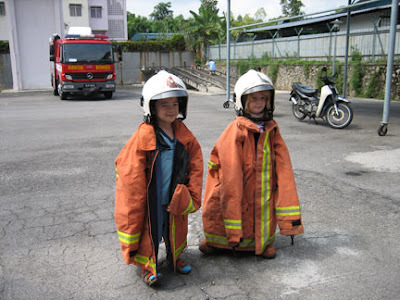 As you can see, the children looked terribly cute in them. 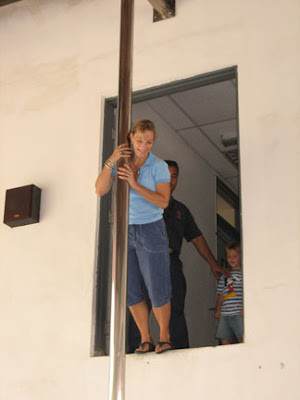 The only activity that was off-limits to the children was the ‘sliding down the pole’. This irked the kids somewhat but was made up for by the parents sliding down and the kids cheering them on. 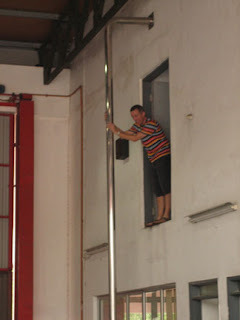 Some Dads refused to slide, and thus, some very brave Mums took to the pole, much to the delight of the little ones! 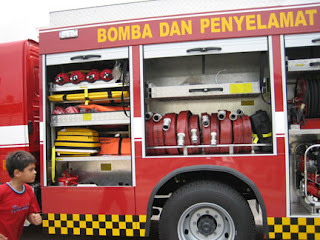 All in all, it was a great day and the hospitality of the Fire Station staff made it a wonderful experience for all of us from ibu. We shall most certainly be back before the end of the year. So if you missed it this time, look out for the next visit and sign up early! The long awaited HANDS-ON session! This is my truck buddy... pls back off! Its' OK Melissa - you can do it!! Wow Mum - you go girl! 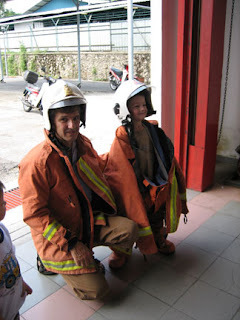 Time to pose in the Fireman's attire ... how cute can the kids get??!! Happy faces all around - What a great day! There was overwhelming response to this course, and with a limited number of spaces, some members even had to be turned down. 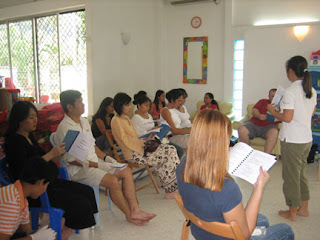 Many members sent their domestic helpers for the course as many have to deal with young children most of their daily lives. Lynette of ScubaZone has been running the ScubaZone store for 6 years, and has at least 20 years of diving experience , and thus CPR and First Aid behind her. 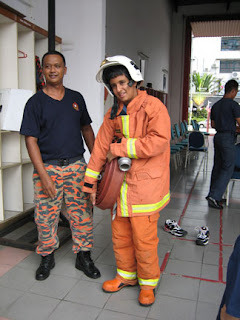 It was very much a hands on course, with all of us taking turns at the mannequin, blowing hard, trying to inflate the chest, some of us failing miserably, yet some proving themselves highly capable, despite their petite size. 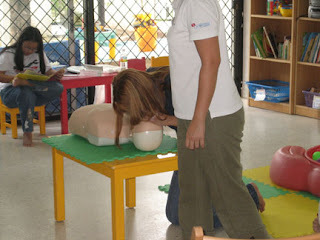 This was a very basic course in CPR and First Aid, however, it gave an adequate insight into it. 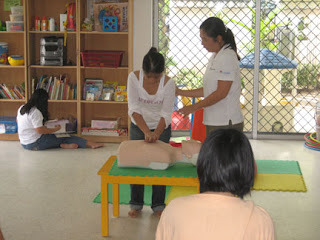 Some participants had studied CPR in the past, but as with anything, if you have not used it for a long while, you get rusty. So, the refresher was good. 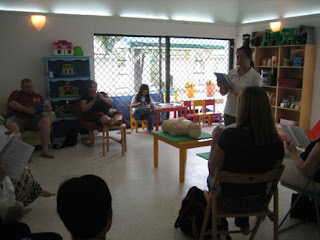 Especially now that many of us have young children or even infants, and along with that the high possiblity of choking, accidents and burns, this course not only taught us what needed to be done, but also what we could do to prevent it. There is nothing like the helpless feeling one gets when faced with a life threatening situation and not knowing what to do. ADEQUATE AID PROVIDED IS BETTER THAN PERFECT AID WITHHELD.